If you’ve been in church long enough, you’ll know that the story of Abraham offering up his son as a sacrifice is held up as the ultimate demonstration of faith and spiritual maturity. As the story is told in Genesis 22, God ‘tests’ Abraham by asking him to offer up his son Isaac on Mount Moriah. Without hesitating Abraham obeys the voice he hears – escorting his son up the mountain, binding him to a stone altar and raising his knife to kill him. It’s a story that’s all the more pertinent given that Isaac was the longed-for son of his wife Sarah; a miracle of providence and the means through which God’s promises for the nation of Israel were to be fulfilled (Genesis 21:1-7). For Christians, the story reveals a heart that is completely surrendered to the purposes of God and as such, Abraham becomes lauded as the “father of faith” and a model for all of us to follow (Hebrews 11:17-19, Romans 4:16). Of course, Abraham didn’t actually go on to kill his son. God stopped him at the last minute and an innocent ram found in a nearby bush acted as a replacement (Genesis 22:12-14). It’s a story that makes for shocking reading – particularly for non-church readers who are not overly familiar with its plot. 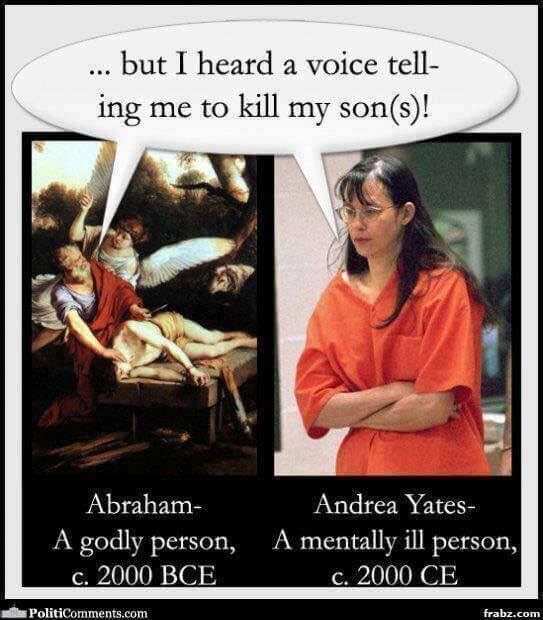 Did Abraham imagine the voice he was hearing and if so, was he a mentally deranged child-killer? Or worse still, did God really tell Abraham to kill his son? If he did, what kind of God are we dealing with here? They’re good questions and not unreasonable ones. Even in my own ministry equipping people to hear God’s voice, if someone told me that God had commanded them to kill their child, I’d quickly tell them that the voice they were hearing was the voice of the Enemy and definitely not from God. Then I’d refer them to a health professional. At God Conversations, we know that a message such as this is utterly incompatible with the character and nature of God. So what is going on here? Why the double standard in the Scriptures compared to now? Was God our “loving father” (Matthew 6:9, Luke 15:11-32) once a cruel despot who took pleasure in the murder of innocent children? It’s important to note that the original forebears of this material, the Jews, debate this scene profusely. In fact, Jewish tradition has a long history of arguing that Abraham failed God’s test because he didn’t protest against God’s command like he did in the threat against the destruction of Sodom and Gomorrah (Genesis 18:16-33).2 In other words, Abraham should have known God would never have demanded child sacrifice. However, in this case it appears that Abraham didn’t know. Unlike the Sodom and Gomorrah scene, he responds without question, loading up his donkey and immediately setting out on the journey up the mountain. His compliance says a lot about his expectations of what God was like. In Abraham’s world, the gods readily demanded sacrifices of their subjects. Acceptable offerings included precious belongings such as food, jewellery, animals and in some cases, children. Abraham’s understanding of “Yahweh” as just another god in the pantheon would have been shaped by the context in which he lived – a world which understood the gods to be mostly angry and where sacrifice and offerings acted to appease them (See podcast: The Big Story: Why Creation-Science Debates are Missing the Point ). An understanding of the ancient context makes this scene all the more potent. The God of the Bible adopts the mask of his rival gods in order to reveal his true nature.3 When God intervenes to stay Abraham’s hand, Abraham receives an in-your-face object lesson of who this God really was. This God was unlike other gods. This God desired the rending of hearts, not the slaughter of children. In fact, this God did not even require the killing of rams from a thicket. It’s a truth that becomes clearer as time goes on. As Israel’s history unfolds, people begin to see more of the truth of God’s heart. Unlike the gods of the Ancient Near East, the God of Abraham, Isaac, and Jacob did not revel in sacrifices like a bloodthirsty tyrant. Child sacrifice is condemned in the clearest of terms and is seen as one of the reasons for Israel’s exile when they disobey (Leviticus 18:21, Deuteronomy 12:31; 18:10). Later it becomes clear that God did not even delight in the blood of cows or sheep (Ps. 50:9-13, Hosea 6:6, Isaiah 58:5-6, Amos 5:21-24, Jeremiah 7:22-23), but preferred acts of mercy and compassion as a sign of worship. Finally, in the coming of Jesus, God’s heart is fully revealed. In dying on the cross, God showed that he would rather provide his own sacrifice than to receive sacrifices from others. Jesus’ death finally signalled the end of a system that was never on God’s heart. The reason why the story of Abraham on Mount Moriah doesn’t bother churchgoers so much today is that unlike our predecessors, we have a clear understanding of what God is like. Our knowledge of God is far greater than Abraham’s ever was. So when God speaks, it’s easy for us to discern his voice. Everything he says reflects the heart of the one who welcomed little children onto his lap (Matthew 19:14) and showed his love by offering up his own life (John 15:13). Unlike the prophets of old who only saw in “shadows” (Hebrews 8:5), we have seen Jesus, the “exact representation” of God’s being (Hebrews 1:2) and the “perfect image of the invisible God” (Colossians 1:3). We know that God would never call for the killing of an innocent child. We know that as a heavenly father, his voice will only ever produce love, joy, and peace (Galatians 5:22) and that our natural response to him should be to surrender our hearts and demonstrate our faith by showing love and mercy to others just as he did. 1. Dawkins, Richard (2016). The God Delusion, UK: Black Swan. p.31. 3. For more on this idea, see Boyd, Greg (2017). Cross Vision: How the Crucifixion of Jesus Makes Sense of Old Testament Violence, U.S: Fortress Press, p.231ff.